HID Global announced the launch of its veriCLASS payment and ticketing embedded reader platform, a solution that gives developers everything they need to speed time to market for products that support both closed- and open-loop payment schemes plus all contactless technologies and protocols in one system. The platform is based on adaptable contactless reader technology, and includes a range of integration tools, support and global product approvals and technology certifications. The associated Developer Tool Kit, online Developer Center and Embedded Device Manager enable integrators to take their own contactless solutions to market faster. The open veriCLASS platform supports many different card technologies including MIFARE, DESFire and iCLASS, a range of protocols and payment schemes including FeliCa, EMVCo, Calypso, MasterCard PayPass, Visa payWave and American Express expresspay, and all computer operating systems including Windows and Windows CE. Linux and Mac will be supported early 2011. The veriCLASS platform is designed for current contactless technologies and will accommodate contact cards as well as future payment technologies and functional requirements. Remote servicing, diagnostics, firmware upgrades and life cycle management of embedded veriCLASS readers are all enabled by the Embedded Device Manager. The platform includes full CE and FCC modular approvals, enabling OEMs, system integrators and manufacturers of cashless payment and ticketing systems to accelerate certification of their finished solutions. The veriCLASS platform can be embedded into a range of payment and ticketing equipment including handheld, point-of-sale, kiosk and retail payment terminals, enabling applications such as automatic fare collection and ticketing, cashless payment, banking/ATM, vending and loyalty solutions. 3300 Reader Core – Designed for space-constrained applications such as handheld payment devices; supports up to four external contactless smart card interfaces; CE-approved. 3500 Reader Board – Designed for terminal applications, providing integration with an embedded antenna and onboard SAM socket; FCC Modular approved. 3700 Enhanced Reader Board – Designed for ticket vending machines and applications requiring multiple antennas. 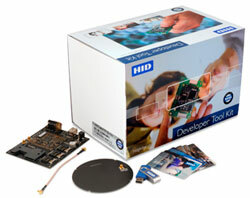 Developer Tool Kit – Includes thorough documentation, a veriCLASS developer board and antennas along with a veriCLASS 3300 reader core, drivers, test credentials and sample code. Developer Center – A secure, online developer portal for access to all relevant technical resources, software tools, demonstration applications, configuration tools and documentation required to accelerate solution designs. Embedded Device Manager – An integrated Web server gives integrators and system administrators access to embedded veriCLASS readers, enabling local or remote service and diagnostics, firmware upgrades and product life cycle management. The veriCLASS offering joins HID Global’s identiCLASS embeddable reader hardware platform to give developers a broad range of turnkey embedded reader solutions spanning cashless payment and e-government applications. The two platform families have been jointly recognized as one of only four finalists in the identification/ID card category of the SESAME awards competition. The awards will be presented Dec. 6 at the CARTES & IDentification conference in Paris, France. The veriCLASS Developer Tool Kit and 3300 reader core samples are available now, as is access to HID’s Developer Center.